Few wartime cities in Virginia held more importance than Petersburg. Nonetheless, the city has, until now, lacked an adequate military history, let alone a history of the civilian home front. The noted Civil War historian, A. Wilson Greene now provides an expertly researched, eloquently written study of the city that was second only to Richmond in size and strategic significance. Industrial, commercial, and extremely prosperous, Petersburg was also home to a large African American community, including the state's highest percentage of free blacks. On the eve of the Civil War, the city elected a conservative, pro-Union approach to the sectional crisis. Little more than a month before Virginia's secession did Petersburg finally express pro-Confederate sentiments, at which point the city threw itself wholeheartedly into the effort, with large numbers of both white and black men serving. 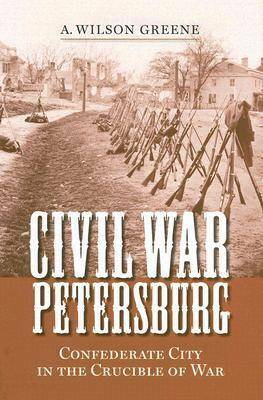 Over the next four years, Petersburg's citizens watched their once-beautiful city become first a conduit for transient soldiers from the Deep South, then an armed camp, and finally the focus of one of the Civil War's most protracted and damaging campaigns. (The fall of Richmond and collapse of the Confederate war effort in Virginia followed close on Grant's ultimate success in Petersburg.) At war's end, Petersburg's antebellum prosperity evaporated under pressures from inflation, chronic shortages, and the extensive damage done by Union artillery shells. Greene's book tracks both Petersburg's civilian experience and the city's place in Confederate military strategy and administration. Employing scores of unpublished sources, the book weaves a uniquely personal story of thousands of citizen - free blacks, slaves and their holders, factory owners, merchants - all of whom shared a singular experience in Civil War Virginia. "This is an important contribution to the growing genre of community and home-front studies of the Civil War. The author has thoroughly accomplished his goal of presenting the story of Petersburg, one of the most important Confederate cities.... The scholarship is thoroughly sound and detailed.--James McPherson, Princeton University, author of Battle Cry of Freedom: The Civil War Era "This manuscript rests on a prodigious achievement: it surveys, to an impressive and exhaustive degree, the unpublished stories that touch on the story of Petersburg.... [combined] with the best current scholarship of the period. The result is an original work that should stand as the history of Civil War Petersburg for many years to come.